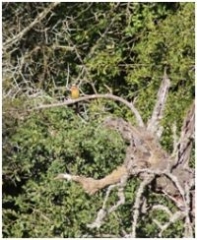 We’re very excited here at Shamwari Game Reserve as we witnessed a very rare thing this weekend. 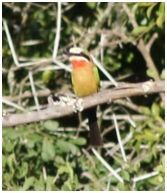 An unconfirmed sighting of White Fronted Bee Eaters was reported. This species of bird is not normally found on Shamwari Game Reserve and in all the distribution maps the closest population range is about 350km to 400km’s further north of us. We went to the reported area a few hours later without much hope, but surprisingly within one minute of turning the vehicle off we spotted a pair of these beautiful birds. 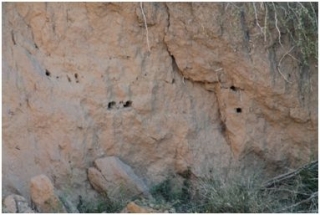 As you can see from the photos, the area that we found them in is perfect for nesting colonies of these birds. They tunnel into sandbanks and cliffs in colonies of up to 200 individuals. They have a very complex intricate social structure. Colonies form and build up of extended family groups with overlapping generations known as clans, which exhibit cooperative breeding. What this means is that any related birds that are non breeding will assist a breeding couple in all aspects of nesting (helping to dig the tunnel), feeding and rearing of the chicks to ensure a much higher survival rate of the family gene. They typically sit on exposed branches or trees where they will glide down and catch flying insects out of the air. In this case it is normally bees. About a week ago we also got reports of another strange visitor. This report was of a Bronze Winged courser. A rather drab looking nondescript ground dwelling bird. 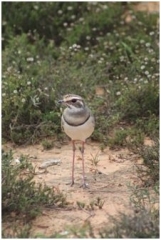 At a glance, and because it is not naturally found anywhere close to the Eastern Cape, it may have been hiding under the radar and slipping by as a juvenile Crowned Lapwing. But once we went out and saw it close up there is no mistaking this bird. The southernmost distribution of this bird species is found just south of Durban on the Kwa- Zulu Natal East Coast of South Africa. This is not the first time we have had strange avian friends visiting us. A few years ago it was the long stay colony of Openbilled Storks and the White Headed Vulture that was around for a few days. Generally these sightings are once off and are due to birds being blown off course or simply getting lost. Sometimes if you are lucky enough they will stay, become resident and start a successful population. I hope this is the case with our latest two visitors. Shamwari Game Reserve is such a fantastic place even the birds are getting to hear about it and wanting to get in on the action!